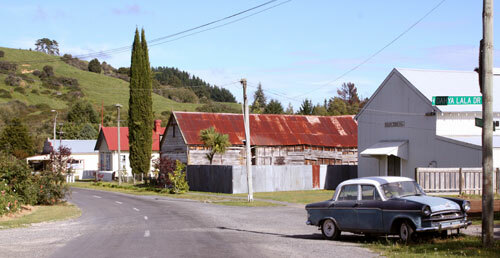 Kākahi's main street has not changed much since Peter McIntyre painted it in the early 1970s. The town hall is still there, as are three of the four shops depicted in his painting. The casually parked 1950s Standard Vanguard gives this 2011 scene an old-time feel.